ww2dbasePrince Takahito was born in 1915 as the fourth son of Emperor Taisho and Empress Teimei of Japan. 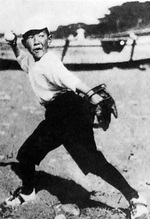 He attended the Gakushuin school between 1922 and 1932 and the Japanese Army Academy between 1932 and Jun 1936. He subsequently graduated from the Army Staff College. In Dec 1935, Emperor Showa, his older brother, gave him the authorization to start a new branch of the Imperial family, Mikasa. In 1937, he was promoted to the rank of lieutenant 1st class. In 1939, he was promoted to the rank of captain. In 1941, he was promoted to the rank of major. On 22 Oct 1941, he married Yuriko Takagi, the second daughter of Viscount Masanori Takagi; they would have five children. Between Jan 1943 and Jan 1944, he was attached to the headquarters of the Japanese Army's China Expeditionary Army in Nanjing, China. He criticized the atrocities committed by his fellow comrades against the Chinese, but was unable to stop them; he might have known the deployment of biological weapons in China, but again was unable to influence the stop of their use. In the final year of the war, he was first attached to the Army Section of the Imperial General Headquarters in Tokyo and then was given charge of the training of the personnel of the air branch of the Japanese Army. He rose to the rank of major by the end of WW2. 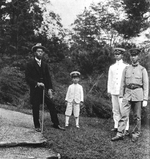 After the war, he urged Emperor Showa to abdicate before the Privy Council. In the late 1940s, he began studying archeology, Middle Eastern studies, and Semitic languages at the Tokyo University. He was a guest lecturer in many universities in Japan and other countries in Middle Eastern studies and archeology. 2 Dec 1915 Prince Takahito was born in the Imperial Palace at Tokyo, Japan. 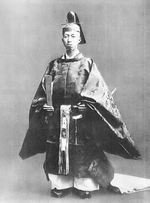 2 Dec 1935 Prince Takahito was made the head of his own branch of the Imperial family, Mikasa. 22 Oct 1941 Prince Takahito married Yuriko Takagi. 26 Apr 1944 Prince Takahito's daughter Princess Yasuko was born. 5 Jan 1946 Prince Takahito's son Princess Tomohito was born. 11 Feb 1948 Prince Takahito's son Prince Yoshihito was born. 23 Oct 1951 Prince Takahito's daughter Princess Masako was born. 29 Dec 1954 Prince Takahito's son Prince Norihito was born. 5 Mar 1957 Prince Takahito was made Knight of the Order of the Elephant of Denmark. 3 Sep 1982 Prince Takahito was made Knight Grand Cross of the Order of Merit of the Italian Republic.